Centuries of travelers have stopped in Bedford County to rest, relax and refresh. While the faces have changed, many of the popular stops have not. 10/09 Kitchen is a small, dinner-only restaurant in downtown Bedford. The highly-acclaimed menu is described as “Italian and Mediterranean inspired.” Reservations are a must on Fridays and Saturdays. Other popular stops include Slick’s Ivy Stone Restaurant, in Osterburg, where servers in historic attire serve up homestyle meals. From intimate dining rooms festooned with antiques to a large banquet hall, the Ivy Stone is well worth the 10 minute drive. The Arena Restaurant in Bedford, while known for their Prime Rib, serves breakfast, lunch and dinner at surprisingly affordable prices. The Arena can serve groups from 10 up to 200 people – so bring all of your friends and relatives. The Bedford Springs Resort, which reopened in 2007, after a $120 million renovation, has been a boon to area restaurants, providing a new stream of customers, even though the resort has five fine restaurants of its own. Guests at the 216 room facility, now managed by Omni, enjoy exploring Bedford County, and that has added fuel to the growth of our local economy. Long before the Bedford Springs reopened, area inns and restaurants with rich histories and great service have been welcoming visitors. Golden Eagle Inn in downtown Bedford was originally a waystop for stagecoach travelers in the late 1700’s. Extensively restored, the Inn’s dining and guest rooms are tastefully appointed with antiques. Two elegant dining rooms and a screened-in dining porch feature a seasonal menu of regional and Colonial favorites, with a focus on local meats, cheeses, produce and more. Sunday brunch is a weekend favorite. Reservations are highly recommended for any meal. The Jean Bonnet Tavern dates back to 1762. The elegant stone building offers dining on the ground floor next to a huge stone fireplace. The timber frame ceiling, dark with the smoke of centuries, surround guests in an Early American Atmosphere. The timber frame ceiling, dark with the smoke of centuries, surrounds guests in an Early American atmosphere. The intimate restaurant offers classic fare like fresh crab cakes, deli sandwiches, filet mignon, pasta or burgers made of beef or locally-farmed bison. In the tavern upstairs, friends gather to enjoy a great selection of Pennsylvania microbrews, specialty drinks and wine. Overnight stays in any of the four rooms and suites includes a full country breakfast and possibly, according to many overnight guests, a glimpse of the supernatural. The Original Italian Pizza serves a full Italian menu that is sure to please everyone in their newly updated restaurant in Bedford. Breezewood is home to the area’s only Perkins. Known for serving breakfast 24 hours a day, they also offer an unbeatable lineup of baked treats. Authentic Mexican cuisine is available at Salsa’s Mexican Grille near the Bedford Turnpike Exchange (full bar available) or at Azteca Mexican Restaurant on Rt. 30 (Mile Level) just east of Bedford (a BYOB establishment). Your Game Bar & Grill in Breezewood offers a wide menu of casual and bar food favorites, as well as lots of TVs so you can watch your favorite team play! 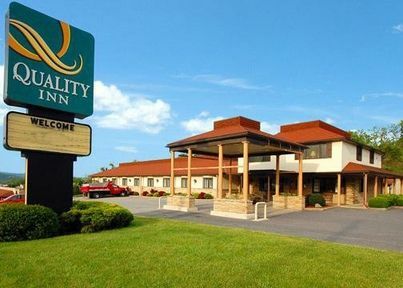 Bedford County also offers travelers familiar choices for lodging–from the new 84-room Fairfield Inn and Suites in Bedford to longtime favorites like Best Western Bedford Inn, as well as Quality Inn, with locations in both Bedford and Breezewood.